Please note that BIM fund Tranche 2 will ceased in May 2018. The last date for approval of BIM fund T2 in BGP is on 31 May 2018. The Building Information Model (BIM) fund aims to help firms build up BIM collaboration capability by defraying part of the cost incurred in training, consultancy, software or hardware. 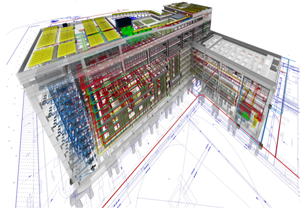 BIM Collaboration helps reduce design inconsistencies and costly reworks downstream. Any firm registered with the Accounting and Corporate Regulatory Authority Singapore (ACRA), the Professional Engineers Board Singapore (PEB), or the Board of Architects (BOA) or BCA and;. Is a member of an on-going or upcoming local construction project to be used for the BIM collaboration. 3. What are the supportable items and funding details? 50% of the supportable item cost if the collaboration achieves 20% KPI* improvement. 70% of the supportable item cost if the collaboration achieves at least 30% KPI* improvement. Each firm can submit up to a maximum of 3 applications starting from July 2015. *KPI refers to the Key Performance Indicators as found in the BIM Execution Plan Template. Each application must carry out BIM collaboration (based on scope outlined in Point 7 of the BIM Execution Plan Template) on an on-going or upcoming local construction project with GFA not less than 5,000sqm. The BIM collaboration must involve at least 2 different disciplines (e.g. Architect, Contractor). To qualify for 70% funding support level, the project must involve at least 3 disciplines with a Main Contractor. Furthermore, the project shall involve from Pre-Tender to Post-Tender stage with model handover from consultant to contractor. The design models to be handed over must be well coordinated and meet the model quality guidelines found in the BIM Execution Plan Template. BCA officer(s) must be invited to witness at least one BIM coordination meeting where the extent and results of BIM collaboration are to be demonstrated clearly. All firms involved in the collaboration are to submit a joint Completion Report within 12 months from the acceptance date of the Letter of Offer. The outcome of the application will be given within 21 working days on the condition that all necessary information is fully furnished. For any clarification, please contact Ms Irene Tan at 6730 4540 or e-mail at irene_tan@bca.gov.sg. Please download and complete the BIM FUND DISBURSEMENT FORM, BIM EXECUTION PLAN TEMPLATE and GIRO FORM. Email all the documents mentioned above to irene_tan@bca.gov.sg. An initial response will be given within 3 working days. The outcome of the claim will be given within 21 working days on the condition that all necessary information is fully furnished. Please note that the contents herein are for the purposes of guidance only. Binding terms will be set out in a Letter of Offer to be issued to successful applicants.